When you think about it, “hope” is an interesting study when you get right down to it. Yes, there is certainly something to be said about someone who has “hope.” “Hope” is akin to bravery in the face of all possible outcomes; an everlasting optimism in good times and bad times. “Hope” puts us in a place where we do not cower to potential defeat though we may be defeated. Unfortunately, “hope” is an outlook many do not share anymore, and in some ways I believe this speaks to one of the deepest fissures in the fabric of our country today. A world without “hope” is a world without heroes. The hero must step forward to be counted. “Hope” moves in that way also ~ forward. 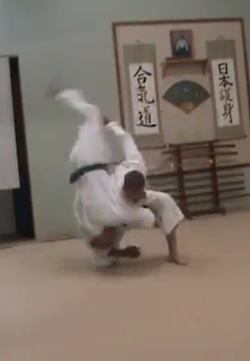 As it relates to aikido, well I submit, if “hope” could be expressed as an aikido movement, “hope” would be the straight down the line entry movement you see in the Classical Technique of Scoop Against the Kick. It is truly a forward movement. I call this motion the Irimi Movement. ****** Now somewhere there is someone re-reading what I just wrote and thinking, “That’s not right ~ Irimi Does Not Mean Forward!” So, before we go further, let me state for the record that “if you own the two books currently in print about Nihon Goshin Aikido: “Nihon Goshin Aikido: The Art and Science of Self Defense” (NGA) and “Integral Aikido” (IA), and I recommend you own both, you probably have noted that my description of the Irimi Movement is not the same as the descriptions defined in the pages of either of these books! Consider pages:46-49 NGA and pages 60-65 of IA. In both books the “Irimi Movement” is described as a movement that encompasses a 360 degree rotation from start to finish (either to the inside or outside). This is not the definition I am using. In my mind, what the books label as “Irimi” (whether an “Inside” or “Outside” Irimi Blend) is actually a combination of three unique Aikido footwork patterns or movements. Presented in this way, the description of “Irimi Tenkan Tenkai:” matches perfectly with both books’ descriptions of the 360 degree blending rotation referred to as “Irimi” ~ whether it is described as an inside or outside irimi blend. What does it matter? Well, I believe that making this distinction is important because if you label what is actually “Irimi Tenkan Tenkai” as “Irimi,” you have no words to accurately describe the footwork patterns you see in Classical Techniques such as “The Unbendable Arm Against the Kick” (whose footwork is most accurately identified as an “Irimi Tenkan” ~ eg: Irimi (Enter) and “Tenkan” (Turn 180 degrees), or the Scoop Against the Kick in which you just Irimi (Enter) straight down the line without turning or pivoting. Why not consider a picture? Look at the footwork diagram to the left. As I said, I call this the Irimi Movement (as does pretty much everyone else except us). You call it whatever you want, but let’s agree on the nature of the movement if we can’t agree on what we should call it. Can we agree that in the picture to the left, Nage is moving straight down the center line into uke, and does not turn or pivot? If we can agree on the picture to the left, arguing over vocabulary becomes an irrelevant exercise. Onward. 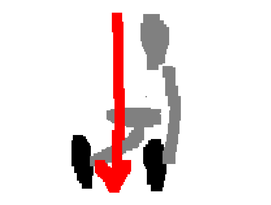 As you can imagine, the Psychological Impact of a strong Irimi (entering) Movement (see picture to the left previously mentioned) ~ which is the entry movement to the Scoop Against the Kick ~ can be devastating to a potential attacker. At the moment the attacker expects to hit you, you are no longer where you once were, AND you are standing right in front of him. You have compromised his mai-ai (distance), and now he is the uncomfortable and vulnerable one. A decisive action ~ rooted in hope and confidence, the Irimi Movement has turned the psychological tables on uke, and it is now the attacker who will be backing away. The advantage of the Irimi Movement is that it takes you immediately to the decisive center of the fight, and it is probably the LAST place your attacker would ever assume you would be. Can you get there in time? Here are a couple of video clips we think you’ll enjoy. They each demonstrate strong Irimi concepts, and there is much to learn from them. Consider the video clip to the left. 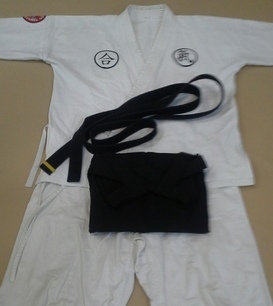 This is a decisive Irimi Movement, somewhat foreign to our nature and initial training. In the beginning, we are taught to react to punches generally by blending away from them. That said, when the attack is “that bad,’ you don’t need to move away at all. Consider a boxer’s response to your haymaker (wild roundhouse punch). He will most likely come straight down your center line and flatten your face before your circular punch ~ which is traveling a greater distance due to its prescribed arc ~ ever makes contact. He may not even bother to cover. This is essentially what happens in the first clip. The decision to enter is met without uke resistance, and the fight is quickly ended with a knockout. I find the small talk at the end humorous. Had the strike failed to knock out the uke, nage is still ideally positioned, to follow up because being “inside” has some very distinct advantages. You’re too close for kicks to be effective, and punches don’t have time to “get wound up,” so they will most likely lack knock out power. Most importantly, your aikido still works inside as well. Zidane, once the best play making midfielder in the world, utilizes a perfect Irimi movement in the next clip down to express his World Cup frustrations back in the day. Of course, the attack made him the world’s most notorious soccer villain (a title currently held by infamous biter of opponent’s flesh ~ Luis Suarez). Zidane’s decisive Irimi Movement is epic nevertheless. Now one of the best Irimi Movement decisions of all time is here (video to the immediate left). Note how this martially trained Clemson football fan is completely psychologically shattered the moment the tiny rooster (eg: Gamecock) decides to enter. Filmed at a football tailgate in Clemson SC, we are especially thankful that the Clemson fan was not harmed in the filming of this video. Regrettably, the fan in question did soil a perfectly good pair of blue jeans, but as everyone knows, Clemson fans are used to soiling their britches at the sight of Gamecocks nearby. #1 It is the natural and arguably quickest response to all common circular attacks (haymakers, roundhouse punches, etc. ); especially when they are thrown by untrained attackers. #2 It puts us in the center of the action, and forces our opponent to the outside. #3 It is often psychologically devastating for uke ~ as you are not “supposed to” enter when you are attacked, or about to be attacked. I wonder, what is the Latin phrase for “When I Irimi, I Hope” ~~~ I need to know because I want that to be my motto. In summary ~ The Irimi Movement Is The Process of Motion that Takes You To The Place Your Attacker Never Expects, or Wants, You to Be. Namely in the Middle of Destructive Things!